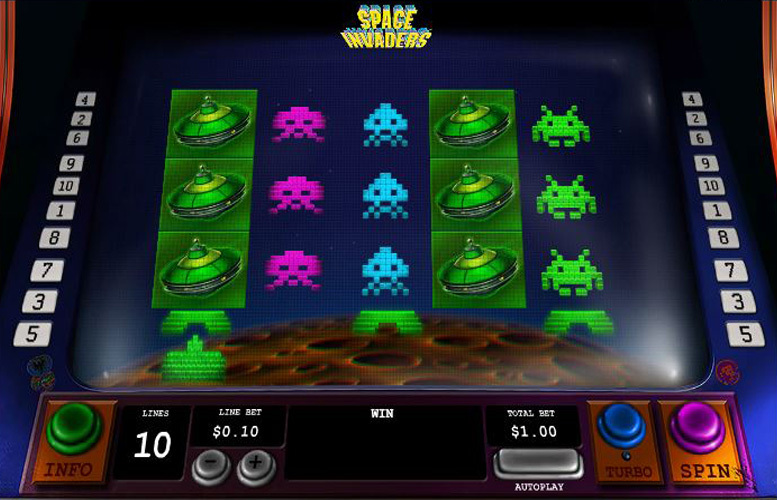 Based on the early video game, the Space Invaders slot from Playtech is an absolute must for all arcade aficionados. The five reel, three row gameboard has been styled on an old school cabinet – complete with controls, coin slots, and all other expected trimmings. Stylistically, and feature-wise, Space Invaders is a very strong title. However, there is one major drawback with it. The main game prizes are woefully small. This is somewhat negated by the exciting and lucrative bonus rounds on the game but not entirely. That said, if you grew up pumping 20ps into arcades back in the late-70’s, this fond retrospective look at one of the first true classic games might just be for you. Great theme. This relic from the annals of gaming history makes an ideal subject to base a casino game around. Fantastic bonuses. 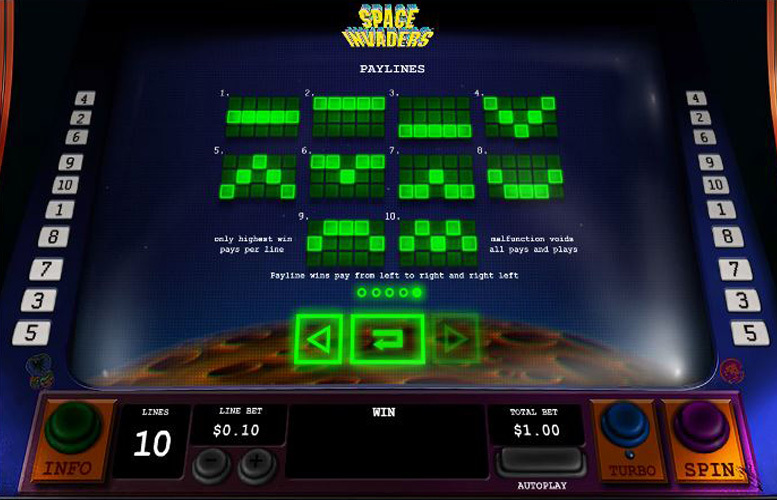 The designers have even borrowed elements of the original Space Invaders game to create some memorable slot machine features. Solid artwork that stays true to the content upon which it’s based. The programmers have captured the feel of this retro gaming classic perfectly. Tragically low main game prizes. Many machines offer up to 10,000 coins for hitting a big winning combination. Space Invaders’ top prize is just 150x the line bet. 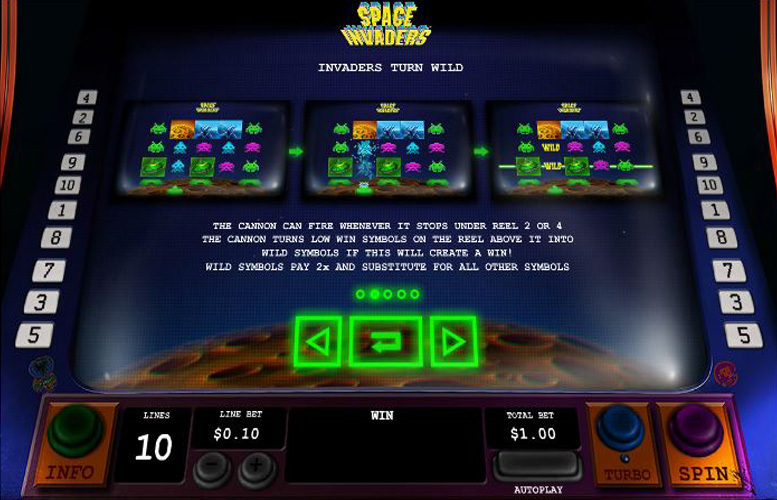 Although necessary for some of its special features, Space Invaders restricts players from altering the number of win lines used. Cratered planet = 150x the line bet. Purple monster = 50x the line bet. Green flying saucer = 30x the line bet. Blue alien craft = 25x the line bet. 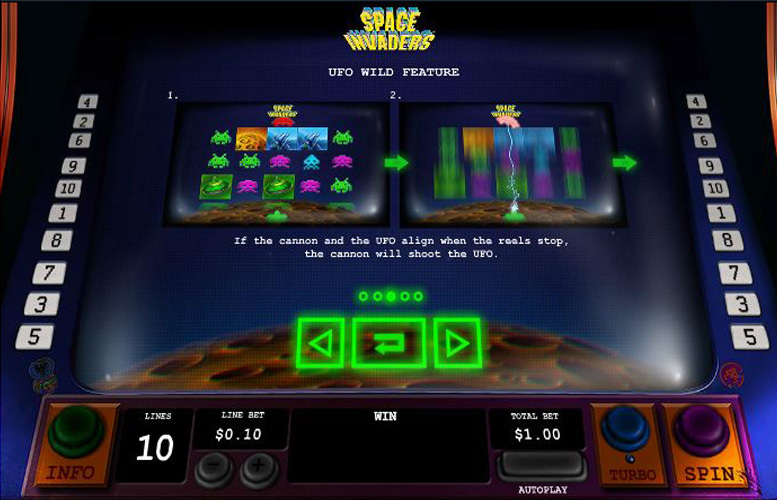 Without doubt, one of the strongest aspects of the Space Invaders slot machine is its bonus rounds. The creators have remained true to the original content of the classic 1978 title, and worked this into its various gameplay features. This gives it a real old school gaming charm. In a nod to the classic video game, there is a cannon located at the bottom of the screen. If it stops under reel two or four, it fires and turns low win symbols on the corresponding reel into wilds – if it can create a win. What’s more, these wild symbols increase the value of any winnings by 2x, and can substitute for every other symbol in the game. 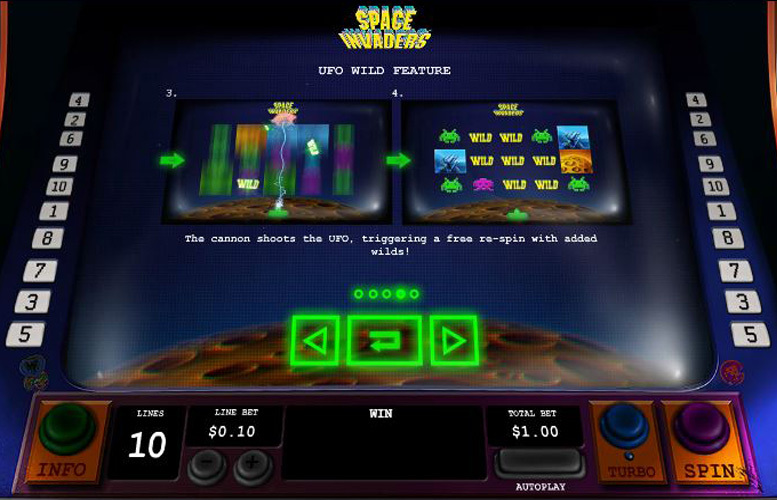 If the UFO at the top of the screen, and the cannon at the bottom align when the reels stop, the cannon shoots the UFO, triggering a free re-spin with extra wilds added to the reels. All the win lines on the game pay both left to right and right to left. This doubles the potential chances of a win on any single spin. Not bad. Purple, green, or blue aliens = 20x the line bet. One minor criticism of the Space Invaders slot machine is that it doesn’t allow players to adjust the number of win lines available to them. There are ten that are fixed and cannot be varied. That said, players are of course able to alter the size of the bet placed on each. There are various increments between the lowest value of 1p, and the highest of £20. Therefore, the lowest possible bet per spin is just 1p, and the highest is £200. This might sound like a lot but compared with many of the slot’s peers its paltry – some games these days offer a maximum bet of ten times this figure. Clearly, Space Invaders does not cater for the very highest rollers around. The Space Invaders slot machine is a lot of fun. It looks fantastic, has some out of this world bonus features, and the designers’ efforts at ensuring the artwork and feel remains true to the 1978 game is commendable. Unfortunately, it really is difficult to get over how low the main game prizes are. Hitting five-of-a-kind doesn’t happen all that often and when it does, it’s nice to get a decent reward. The meagre 150 coin top prize offered doesn’t even begin to cut it. It’s a real shame too because the rest of the game is excellently thought out and delivered. This game has a rating of 4 / 5 with 217 total reviews by the users.